Definition at line 62 of file ImmutableMap.h. Definition at line 68 of file ImmutableMap.h. Definition at line 69 of file ImmutableMap.h. Definition at line 66 of file ImmutableMap.h. Definition at line 67 of file ImmutableMap.h. Definition at line 70 of file ImmutableMap.h. Definition at line 64 of file ImmutableMap.h. Definition at line 65 of file ImmutableMap.h. Constructs a map from a pointer to a tree root. In general one should use a Factory object to create maps instead of directly invoking the constructor, but there are cases where make this constructor public is useful. Definition at line 80 of file ImmutableMap.h. Definition at line 84 of file ImmutableMap.h. Definition at line 88 of file ImmutableMap.h. Definition at line 220 of file ImmutableMap.h. Definition at line 132 of file ImmutableMap.h. Definition at line 221 of file ImmutableMap.h. Definition at line 184 of file ImmutableMap.h. Definition at line 192 of file ImmutableMap.h. Definition at line 243 of file ImmutableMap.h. getMaxElement - Returns the <key,value> pair in the ImmutableMap for which key is the highest in the ordering of keys in the map. This method returns NULL if the map is empty. Definition at line 235 of file ImmutableMap.h. References llvm::ImutAVLTree< ImutInfo >::getMaxElement(), and llvm::ImutAVLTree< ImutInfo >::getValue(). Definition at line 144 of file ImmutableMap.h. Definition at line 149 of file ImmutableMap.h. Definition at line 159 of file ImmutableMap.h. Definition at line 223 of file ImmutableMap.h. References llvm::ImutAVLTree< ImutInfo >::find(), and llvm::ImutAVLTree< ImutInfo >::getValue(). Definition at line 155 of file ImmutableMap.h. Definition at line 151 of file ImmutableMap.h. Definition at line 140 of file ImmutableMap.h. References llvm::ImutAVLTree< ImutInfo >::isNotEqual(), and llvm::ImmutableMap< KeyT, ValT, ValInfo >::Root. Definition at line 92 of file ImmutableMap.h. References llvm::ImutAVLTree< ImutInfo >::release(), llvm::ImutAVLTree< ImutInfo >::retain(), and llvm::ImmutableMap< KeyT, ValT, ValInfo >::Root. Definition at line 136 of file ImmutableMap.h. References llvm::ImutAVLTree< ImutInfo >::isEqual(), and llvm::ImmutableMap< KeyT, ValT, ValInfo >::Root. Definition at line 245 of file ImmutableMap.h. References llvm::FoldingSetNodeID::AddPointer(), and llvm::ImmutableMap< KeyT, ValT, ValInfo >::Root. Definition at line 249 of file ImmutableMap.h. References llvm::ImutKeyValueInfo< T, S >::Profile(). Definition at line 203 of file ImmutableMap.h. Definition at line 73 of file ImmutableMap.h. 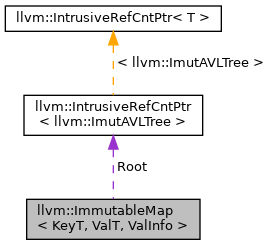 Referenced by llvm::ImmutableMap< KeyT, ValT, ValInfo >::Factory::add(), llvm::ImmutableMap< KeyT, ValT, ValInfo >::operator!=(), llvm::ImmutableMap< KeyT, ValT, ValInfo >::operator=(), llvm::ImmutableMap< KeyT, ValT, ValInfo >::operator==(), and llvm::ImmutableMap< KeyT, ValT, ValInfo >::Profile().